That heli ride threw me for a loop. I love the experience of being in a helicopter. It's a serene, peaceful feeling, floating up that high, moving kinda slow, having that breathtaking view. It makes me feel...well, free as a bird. But watching Cynthia fly the Schweitzer (and watching Kelly in the Cessna) made me realize that piloting is busy work, demanding sharp mental focus and nearly constant coordinated multi-tasking. You don't get to sit around and watch the clouds and the hills and the tiny people on the baseball diamond like you do if you are a passenger. I know that's obvious, but somehow I didn't think of it. And while I'm on the subject, the expense already had me a little hesitant. Not to mention the fact that this endeavor will demand considerable ongoing expense and time (in helicopters) just to maintain a safe level of competence, let alone improve skills. After the helicopter ride, I was pretty distressed about the whole thing. I didn't touch a textbook all week. I wondered how I might back out gracefully, and pondered other ways to spend my time in Hawaii. Yeah. Are you thinking what I'm thinking? Either helicopters are the new must-have in music videos, or...synchronicity? Well, onward to flight school, let's see what happens. lovin the synchronicity -- but perhaps the weirdest thing is that I looked up Tokio Hotel and that singer is a *boy*! 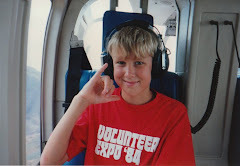 I've wanted to be a helicopter pilot ever since my first ride at age 14. Flying kids: "Sky's the Limit"